This week I managed a rare foray to a live game over in south-east London. Having earned a creditable draw at National League side Braintree Town in the FA Trophy on Saturday, Dulwich Hamlet welcomed the Essex club back to Champion Hill for the replay on Tuesday night. Playing in the seventh tier, the hosts came into the game as the lowest-ranked team left in the competition so were the underdogs in most people's eyes. Braintree seemed to have the better of the opening exchanges without really taking charge and it was Dulwich who took the lead with a penalty shortly before the half hour but it was all square at the break after a corner was poorly defended at the near post. After the break, Dulwich took control but only after a moment of outrageous fortune restored their lead when keeper Sam Beasant (son of Dave) saw his clearance hit one of his own defenders and loop back over him into the net. Gavin Rose's players grew in confidence and opened up an unassailable 4-1 lead with 15 minutes to go. By this time Braintree were also down to 10 men and although they pulled one back, there was still time for sub Jacob Erskine to add another as Dulwich recorded a memorable 5-2 win. Next up, in the quarter-finals, is a blockbuster home tie against former third-tier club Macclesfield Town. The Cheshire side are now back in the National League but are among its play-off contenders so will be incredibly tough to beat. Both sides average sizeable crowds so Champion Hill's 3,000 capacity is likely to be reached for the game which takes place on Saturday 25 February. Tickets are on sale online and are being kept at the normal rate of £10 for adults which is impressive. 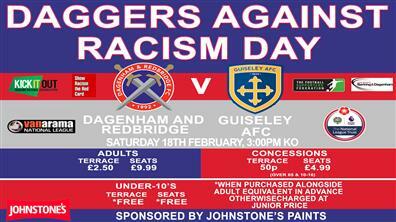 Elsewhere this week, it's Dagenham & Redbridge's annual 'Daggers Against Racism Day'. Guiseley are the visitors for a National League game and tickets start at just £2.50 for adults if bought in advance. Southall also have their hugely important FA Vase quarter-final against Cleethorpes Town on Saturday. They will start as considerable underdogs but the lure of a trip to nearby Wembley for the final could see them raise their game again. We're lucky again this week to have a blog from 'Two Men In Search Of The Beautiful Game' who paid a visit to Barking who are currently top of the Essex Senior League. I've never been to Mayesbrook Park so will take particular interest in this. Lastly this week, thanks to reader Moran from Israel who visited Leyton Orient as their terrible run continued with defeat against Morecambe. He had a good time nonetheless and sent some great photos of his experiences. Thanks again Moran. I'm heading up to Edinburgh this week. Sadly there don't seem to be any games on while I'm there but I'll try and squeeze in a match down here before I go. Enjoy your week and, as always, let me know what you've been up to. There are over 70 matches in the London area over the next week with action in the FA Cup, EFL, FA Vase and several minor league and county cup competitions. Dagenham & Redbridge v Guiseley @3pm - the Daggers got relegated from League Two last season but are right up in second as they look to make an immediate return. On Saturday they welcome struggling Guiseley for their annual 'Daggers Against Racism Day' where tickets are reduced to just £2.50 (standing) and £9.99 (seats) for adults but you must buy in advance to get the deal. Don't hang about!